Repaint of the United Traffic Team (UTT) Boeing 787-9 in Hainan Airlines colour scheme. Kungfu Panda decals used with friendly permission by Garry Lewis. Base files package for FSX/P3D available at www.juergenbaumbusch.de .Base files package for FS2004 available at http://unitedtrafficteam.com/.. This is an AI aircraft only. Firstly, may I say how much I appreciate your great repaints. 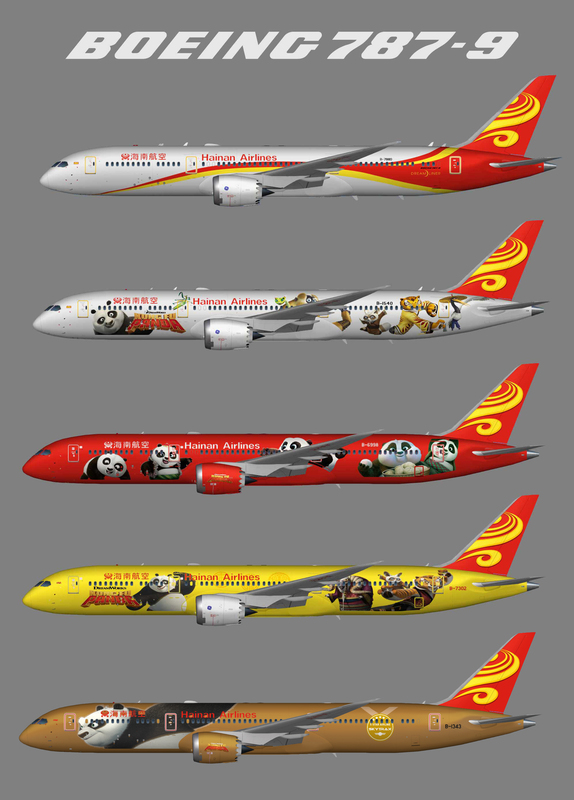 I’ve just downloaded the latest version of the Hainan Airlines Boeing 787-9 for FSX. Although the aircraft config files says there’s ‘Hainan Airlines ‘Kung Fu Panda 4’, unfortunately the download doesn’t include it. Juergen. This repaint is not showing up after installation. I found that you have in the [fltsim.x] section: texture=Hainan. However, the actual texture folder shows: texture.Hainan Airlines. Must delete "Airlines" Also, the registration under the wing is reversed. Thanks for correcting it.